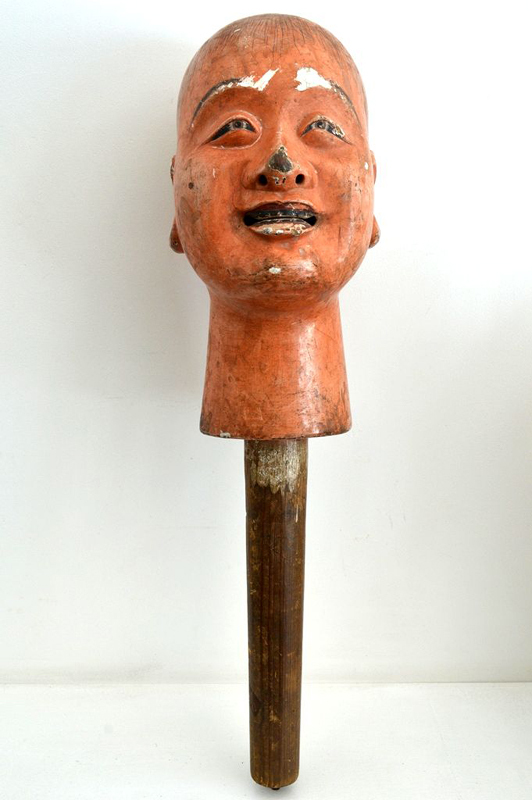 HEAD OF DRUNK (Dealer: titcoRet) – Quite a unique and impressive wooden head of doll similar to ‘Shojo’ in Noh play (as a man who is a heavy drinker and dances on waves), made for ‘Bunraku’ or ‘Joruri’ or sort of local puppet show as probably, with the sculptor’s’s sign of ‘Choun’ as a ‘Busshi’ (sculptor of Buddhist images) of Chusonji temple in Iwate prefecture, Japan, around Edo period, 19th century. Very refined carving and hollowed-out make as its light weight. Aged deterioration as is as seen.